Enrichment – Part I of Our Series | Sit! Stay! Play! Enrichment [en-rich-muh nt] makes something more meaningful, substantial, or rewarding. enrichment as a dynamic process for enhancing animal environments within the context of the animals’ behavioral biology and natural history. Any stimulus which evokes an animal’s interest in a positive way can be considered enriching, including natural and artificial objects, scents, novel foods, and different methods of preparing foods (for example, frozen in ice). I have always loved animals. As a child I relentlessly followed ants on the sidewalk and traipsed behind my grandfather while he fed the pigs and chickens and mules and horses. We would go down to the small pond on his Tennessee farm in the evenings and with a bamboo pole with bacon for bait, attempt to angle catfish that were always returned to their home if they had the misfortune to be caught. So surprisingly or not, I hated zoos. Actually, I was torn. I loved seeing the animals, but even as a five year old I always left feeling overwhelmed by sadness. By the mid-1980s when I was attending grad school in Landscape Architecture and Renewable Natural Resources, zoos were changing. It was my intention to research the growing field of environmental enrichment for captive animals, but even as wonderful changes were being implemented at progressive zoos, I still found it hopelessly depressing. Forward a quick 20 years or so and I found myself working on a government project that required me to stay in the field for up to 15 hours a day. I would drag myself home at ten or eleven often coming home to a disaster of torn pillows and not quite ripe tomato plants looking suspiciously out of place in the living room. I would pile the dogs into the car and drive to the Rillito River for a walk and then go home to finish the gardening not completed by the dogs in the light of Christmas bulbs hanging from the Mulberry tree. It was at that moment I realized my poor dogs were roommates unwittingly caught in captivity. I am typically drawn to clever athletic dogs that share my love for the outdoors. Joining me on little excursions the dogs check in every so often making certain my hopelessly slow legs haven’t crumbled to the ground. They climb agility equipment, retrieve balls they accept as poor substitutions for birds, sniff out rats for game, chase grocery bags instead of rabbits, and learn to shake hands and push a shopping cart for my amusement. But most of the time they lie by my side or simply wait for me to come home. It didn’t seem like enough for dogs that were bred and selected for their intelligence, social affinity for humans, and their athletic skill. That is how Sit! Stay! Play! came to be. Over the past thirteen years the business has evolved. The more dogs I meet the greater my admiration grows, but so does my concern. As Jon Katz so thoughtfully expresses in “the new work of dogs: tending to live, love, and family”, dogs are playing a role in our lives that goes well beyond that of man’s best friend. Dogs are our family, our support system. And our dogs are under increasing pressure to “behave” in urban and social settings as little furry surrogate friends. That’s a lot of responsibility to put on a dog. Even though located in a warehouse, I never wanted Sit! Stay! Play! to warehouse dogs. It was always my goal to improve the lives of dogs and the humans who love them. But over the past couple of years I came to the realization we can do more. Have you noticed the changes in zoos over the past few years? The animals are engaged in activities that stimulate their natural interests. They forage for food, play with toys and objects, and even have visual access to other spec ies. The goal is to enrich their environment and their lives. We have seen the same concept being increasingly applied to companion animals, especially those with behavior issues. 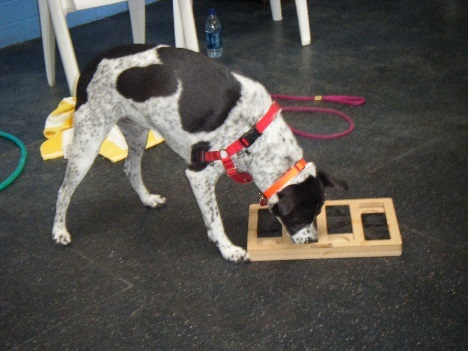 I always encourage the owners in training classes to use their dog’s food for training and foraging and to put some aside for use in puzzle toys so I thought, why not apply some of the same principles to our daycare program? If you follow us on Facebook, you may have noticed that we have been moving towards implementing more organized activities in our transition to a curriculum based program. Our goal is to become a Social Learning Center for Dogs that offers daycare, training, overnight care, and spa services. By evoking your dogs’ interests and enriching their lives, we believe your dog will be a happier friend and companion. These new programs will challenge our daycare dogs by making their environment more complex and more interesting. You may have already noticed some of the new permanent play equipment we have introduced and the addition other more transient objects like boxes. Challenge courses incorporating hoops and tunnels make for fun small group activities. For tho se dogs that eat meals or snacks at daycare, some of their feeding will be more challenging by encouraging the dogs to work for their food. Scent work has been introduced and the small dogs have enjoyed foraging for treats in the new ball pit. Puzzle toys and Kongs are being offered as an added benefit during naptime and for overnight dogs. Exploratory play is being encouraged by providing lots of toys and introducing our new “Do More With Your Dog ™” tricks program. We will continue to encourage appropriate social interaction by maintaining a ratio of one counselor per ten to fifteen dogs. We are also rotating dogs into smaller groups throughout the day to facilitate more structured play. Sensory skills are challenged by including scent work in our program. Small groups of about five dogs are taught to use their keen sense of smell to find food hidden in boxes and objects in the environment. As always we continue to support appropriate behavior by training and rewarding polite behavior. Sit! Stay! Play! also offers one on one training in Dog Day School to reinforce skills you may be working on in your home. 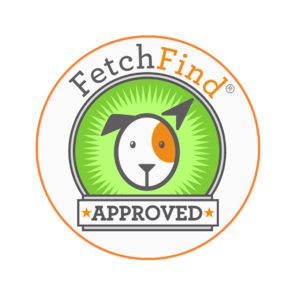 Please let Claudia, Janet, or Emily know if you are interested it adding alternative feeding options, Dog Day School, or the Do More With Your Dogs!™ tricks program into your dog’s day. Enrichment – just one more way Sit! Stay! Play! is committed to sending home not just a tired dog, but a better dog!